Eleven farmerettes (and one dog), Women's Agricultural Camp, Bedford, New York, summer 1917. Courtesy of the Barnard College Archives. With our entry into World War I, a crisis of wide-ranging proportions threatened to jeopardize the domestic and international food supplies in the United States. The government recognized the devastating impact that a much-reduced farm labor force and a lessening of food output from the nation’s farms would have on the overall war relief efforts throughout the world. They initiated a campaign called “Food Will Win the War” and sponsored programs to encourage citizens to take actions at a grassroots level to counter the threats of food shortages through conservation and food production. One of the programs to grow out of these efforts was the Women’s Land Army initiative which was embraced by Barnard’s Dean Virginia Gildersleeve who was the chairman of the standing committee on agriculture for the New York Mayor’s Committee of Women on National Defense. In coordination with Dr. Ida H. Ogilvie, Associate Professor of Geology at Barnard, the Women’s Agricultural Camp in Bedford, New York, was established. Farmerettes working in the potato patch, Women's Agricultural Camp, Bedford, New York, summer 1917. Courtesy of the Barnard College Archives. During the summer of 1917, an experiment was undertaken by many women’s groups, including the women in the Barnard community, throughout the United States to supplement the diminished male labor force on farms, community gardens, large estates, and small home gardens with a female labor force often called the “farmerettes”. The farmerettes were comprised of college girls, trade school students, teachers, businesswomen, and secretaries. This radical idea, which challenged the traditional roles of women, was initially resisted by the naturally conservative farm community. However, as the dire consequences of being unable to maintain and harvest the crops on the farms became apparent, farmers and their wives were willing to give the young women a try. Farmerettes feeding corn to three piglets, Women's Agricultural Camp, Bedford, New York, summer 1917. Photograph by The Mutual Life Quarterly, courtesy of the Barnard College Archives. 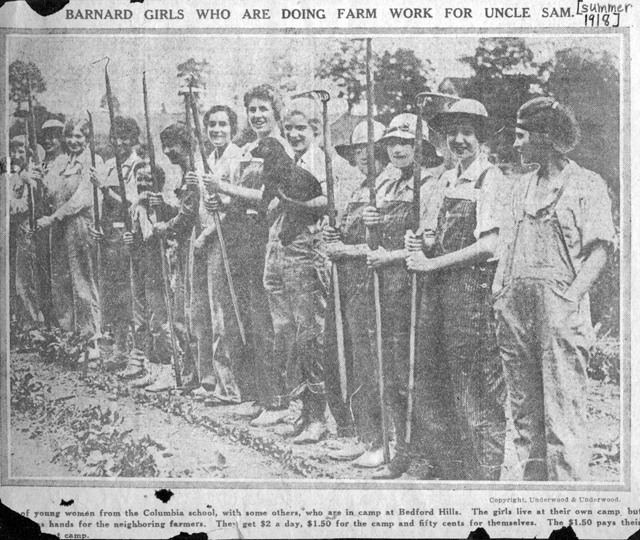 The Bedford Women’s Agricultural Camp, supervised by Dr. Ogilvie, was established by the Women’s Land Army and housed a total of 142 farmerettes, many of them Barnard undergraduates and alumnae, during the summer of 1917. The farmerettes were housed at the farm house and in tents at the Camp and were transported to and from their assigned employers every day thus sparing the farmers and their families the burden of feeding and housing the workers. Although the services of the farmerettes were opposed by most farmers in the early part of the summer, by the middle of July, and then at harvest time in September, the demand for farmerettes exceeded the supply of available workers. The farmers used the farmerettes for planting, weeding, hoeing, haying and harvesting the fruit orchards. The women’s efforts as farm laborers were highly praised by their employers for being conscientious and quick even if they were not as strong as the men. The Women’s Agricultural Camp experiment proved to be such a success that, during the years from 1917 to 1919, in 25 states, more than 20,000 female agricultural workers, or farmerettes, replaced their male counterparts on the farm while the men were fighting in the war in Europe. Dr. Ogilvie eventually helped to organize the national organization, Women’s Land Army of America, and served as its director after the organization became part of the Department of Labor. Indeed, not only were these female volunteers willing to do their part for the country during war time, but the Woman’s Land Army proved that it was able to fund and govern itself without the input of the male dominated government agencies which was a great boost to the suffragist movement! "Barnard Girls Who Are Doing Work For Uncle Sam". Courtesy of the Barnard College Archives. Who knows…without the Barnard “farmerette” in World War I, we may not have had “Rosie the Riveter” in World War II, or the ability to vote in 2009! For more images of Barnard “Farmerettes” of World War I, please visit our Gallery. Readers may also be interested in Soldier’s Mail which features rare letters from the Home Front to U.S. Sgt Sam Avery on the front lines of American involvement in the Great War. These offer a rare glimpse into the lives of those who tended the victory gardens, hung the blue star banners and promoted the Liberty Bond drives. For a complete account of the Barnard farmerettes and the Bedford Camp, as well as Barnard’s close association with the Woman’s Land Army of America during WWI, readers will enjoy a new book about the Land Army–“Fruits of Victory:The Woman’s Land Army in the Great War” by Elaine F.Weiss. It features many documentary treasures and photos from the Barnard Archives, and places this fascinating organization into the context of the war and the suffrage movement.